We’ve had six stupendous days tripping backward through the cleanest and meanest commissioned illustrations that entered my comic art collection during 2009. It’s time for the final pair of drawings… and yes, they’re doozies. The second of two masterpieces created at WonderCon 2009 by comics legend Tony DeZuniga, this dramatic illustration spotlights the stars of DC’s mostly forgotten 1980s mashup of Native American historical drama and sword-and-sandal fantasy, Arak, Son of Thunder. 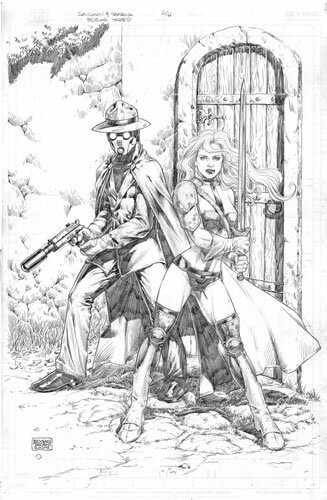 Tony drew about half of the original adventures of Arak and his lady companion, Valda the Iron Maiden. He hasn’t lost the master’s touch. So that’s it in a seven-fragment nutshell: Comic Art Friday’s top artworks from the final year of the Aughts. With any luck, there will be more to come as we forge ahead into the Teen Decade. May you and your loved ones enjoy a happy, healthy, and prosperous New Year in 2010. The penultimate edition of our week-long saunter through the past year of comic art collecting brings us to a pair of pieces commissioned at WonderCon 2009. Neither of these falls specifically into any of my usual themes, but they both feature fantastic renderings of characters I know and love. I couldn’t choose one over the other, so we’ll showcase both today. I’d wanted for some time to see Star Wars artist Hodges’s take on the current Blue Beetle, mostly because I see strong similarities between Tom’s style and that of Cully Hamner, who designed Jaime Reyes’s scarab armor. Tom kicked the concept up a notch by illustrating the Beetle on bold blue art paper. Current Wonder Woman (and former Ms. Marvel) artist Lopresti wanted to apply his skills to a male character this time around, so I asked him to tackle Dave Stevens’s Rocketeer. Aaron’s iconic pinup deserves a place alongside the newly released hardcover collection of Stevens’s work. Tomorrow, we’ll ring out the old year and look ahead to the new, with our last two splendiferous additions to 2009’s greatest and highest. You’ll want to be sure to stop by. And that’s your sixth chapter of Comic Art Year-End, 2009. We’re heading into the home stretch of our seven-day review of the best comic art commissions we picked up during the past twelve months. I believe that I can say without too much fear of contradiction that I’m the only collector in the comic art field who regularly commissions art featuring either Isis, star of the classic 1970s Saturday morning TV series The Secret of Isis (and later, The Shazam!/Isis Hour), or Taarna, the iconic warrior from the groundbreaking animated science fiction anthology Heavy Metal. This year, my favorite new Isis and Taarna artworks both happen to also be entries in my primary commission theme, Common Elements. If you’re going to put together a retro heroine from the Disco Decade and a superhero cocreated and designed by Jack “King” Kirby, there’s one artist at the top of your wish list: Steve “The Dude” Rude. This amazing tableau demonstrates the reason Rude was the perfect choice for this combination. I had no idea what Ed Tadeo — one of the brightest talents among the new school of comics artists coming out of the Philippines — would do with the pairing of Taarna and the Golden Age hero Sandman. Ed devised an evocative scene with a hint of mystery and subtext. Then he drew the heck out of it. In tomorrow’s post, we’ll trot out the two best single-character commissions from 2009 that don’t fit into any of my established theme categories. They’re simply two great drawings that deserve a second look. We’ll see you here in 24. And that’s your fifth chapter of Comic Art Year-End, 2009. Thus far in our nostalgic romp through the past year’s comic art acquisitions, we’ve ogled my favorite new pieces from my two commission themes, Common Elements and Bombshells! Today, we turn our attention to our solo character galleries. As regular visitors to my online art gallery know, I collect unique images of several beloved heroes and heroines. Alas, in 2009, most of those collections didn’t expand, as I focused my limited art-buying resources on my two primary themes. I did, however, pick up a couple of nice additions for my gallery dedicated to one of comics’ premier husband-and-wife duos, the Black Panther and Storm. Alex Niño is, without question, one of the most distinctive stylists the comics industry has ever produced. He created this eye-catchingly impressionistic interpretation of the King of Wakanda at WonderCon 2009. Bob Almond, the guy who puts the “king” in “inking,” took a rough pencil sketch that Mark Beachum included as a bonus gift with an earlier art purchase and transformed it into this powerful image of everyone’s favorite mutant weather wizard. Bob spun Storm’s costume from an idea that Geof Isherwood created for a previous Common Elements commission — an adaptation of an original concept by the legendary Barry Windsor-Smith. More retrospective goodies tomorrow. Be here… or don’t. And that’s your fourth chapter of Comic Art Year-End, 2009. Time to unwrap the third of our seven Comic Art Year-End special editions, taking a fond glance back at the finest commissioned artworks to enter my collection in 2009. So far, we’ve checked out four of the best new pieces in my Common Elements theme gallery. Today, we’ll see a couple of superstar turns in my other primary theme, Bombshells! This year, the Bombshells! series expanded by six, all of which are spectacular. I could have chosen any two to single out, and not have gotten the selection wrong. But I forced myself to choose just two. In my never-humble opinion, Steve Mannion (creator of The Bomb and Fearless Dawn) is one of the great unsung talents in comics. His charming, timeless style deserves a far wider audience than it presently enjoys. His pinup of Golden Age heroine Miss Victory gives testimony to Steve’s unique ability to meld beauty and whimsy. This stunning Bombshell! impressed me so much that it’s been hanging in a place of prominence on my office wall since the day it arrived in the mail. It perfectly expresses a key reason why I enjoy the Bombshells! theme — resurrecting long-forgotten characters from the classic period of comics (in this case, Pat Patriot, one of the earliest red-white-and-blue heroines of the World War II era) for a modern viewership. Michael Dooney, one of my all-time favorite “good girl” artists, took two shots at the Bombshells! concept in 2009. I simply can’t conclude this retrospective without showcasing at least one of Mike’s two gorgeous drawings. Unfortunately, I love them both equally. So, I flipped a coin, and here’s your winner. Airboy’s sometime-nemesis, sometime-comrade Valkyrie meets the power, the passion, the excellence that is Dooney. Giving the former Axis spy the Spear of Destiny — you recall, I’m sure, the Third Reich’s fascination with supernatural artifacts — was a classic Dooney touch. In tomorrow’s installment, we’ll look at this year’s outstanding commissions featuring two of my favorite characters. And that’s your third chapter of Comic Art Year-End, 2009. Day Two of our grand tour through the Best of Comic Art Fridays, 2009 Edition, completes our look at this year’s most noteworthy additions to my Common Elements commission theme. Making his second entry into the Common Elements gallery, Fables artist Lan Medina rocks this action-packed scene pitting the Justice League’s Red Arrow and barbarian warrior Red Sonja against an array of unseen adversaries. Gene Gonzales summons up all kinds of awesome with his lively depiction of Josie and the Pussycats swapping musical talents with another terrific trio, consisting of Catwoman and both the Golden Age and present-day Black Cat. Tomorrow, pinup mania reigns as we salute the best from my second commission theme, Bombshells! And that’s your second chapter of Comic Art Year-End, 2009. By tradition here at SSTOL, we spend our last Friday or two every year looking back fondly at the best comic art commissions to enter my collection during the previous 12 months. Since, due to extenuating circumstances (in case you’re out of the loop, my wife has been hospitalized since December 9 — needless to say, I’ve had other priorities), we’re down to our final Comic Art Friday, I’ve decided to switch things up a bit. We’re going to take the entire last week of the year to celebrate our Best of Comic Art Fridays. Each day between now and New Year’s Eve, we’ll display two artworks that added new dimensions of quality to Uncle Swan’s gallery in 2009. So let’s get after it. Canadian artist Dave Ross flies his Maple Leaf banner high with this striking page starring two of the Great White North’s best-loved crimebusters, Wolverine and Captain Canuck. An artist’s artist if ever there was one, Tony DeZuniga entrances the senses with the floral-themed duo of Poison Ivy and the Black Orchid — the latter of whom Tony co-created. Tomorrow, we’ll check out two more examples of Common Elements spectacle. Be here then, won’t you? And that’s your first chapter of Comic Art Year-End, 2009.